Client: Progressive Foam Technologies, Inc.
COSO Media developed a new website for Progressive Foam Technologies, Inc. Progressive Foam Technologies is a foam manufacturing company dedicated to the commercialization of innovative building products. With strategic anchors in product development, advanced process technology, and product marketing, they invented and brought insulated vinyl siding to the marketplace. 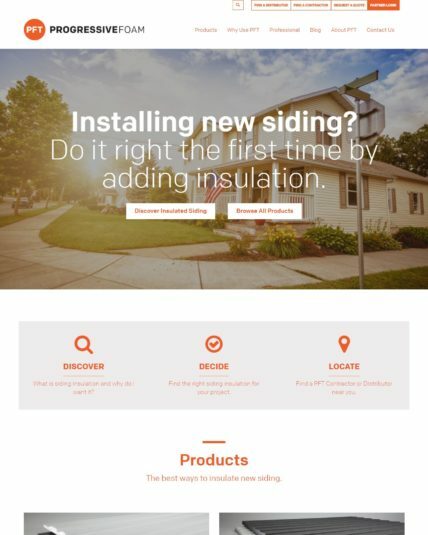 The goal for the Progressive Foam Technologies' website was to display and educate their audience on the wide range of insulation and siding products. Progressive Foam Technologies wanted to provide their potential clients the opportunity to be well informed on the quality of their products and learn exactly which product is right for them before purchasing. We wanted to make it easy for their audience to request a quote or locate a distributor or contractor near them by creating quickly accessible buttons at the top of the page. We reflect Progressive Foam Technologies' brand by incorporating their unique history, showcasing their passion for charitable work, professional expertise, and blog full of educational tips and company news. We also provide Progressive Foam Technologies with HubSpot integration, a wide range of custom modules and landing pages. "Progressive Foam has partnered with COSO Media for several years, and they have made significant strides in helping improve the digital experience of our customers. They worked closely with us to fully understand our business model and processes and built a robust customer portal that has been crucial for us to train multiple audiences on our products and encourage engagement with our brand. We can depend on Coso Media to provide quality work at all times because they understand our brand and business inside and out. We look forward to continuing our partnership with them for years to come." —Lauren Marburger, Marketing Manager at Progressive Foam Technologies. 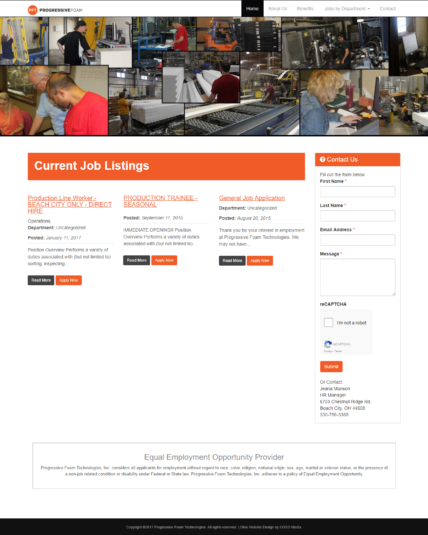 COSO Media created a separate careers website for Progressive Foam Technologies for potential candidates to apply to their growing network of employees. Our team designed a website that is simple and easy for users to apply, learn about the company, and the benefits offered. 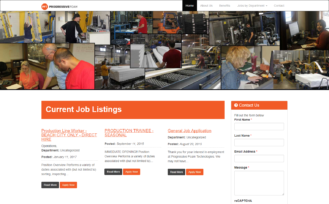 With Progressive Foam Technologies' rapid growth, it was necessary to create a separate website just for their career opportunities. Our team created an informative website that prospective employees can learn about all the career opportunities, benefits, and company culture and values that Progressive Foam Technologies offers. They are looking for the best, qualified candidates to represent their company and having this a career website has been the perfect way to attract these individuals. 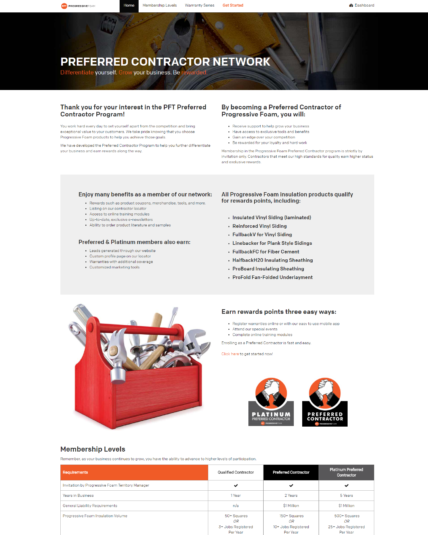 COSO Media has developed a Partner Portal to help members of their Preferred Contractor Program receive support, grow their business, gain access to tools and benefits, and earn rewards along the way. 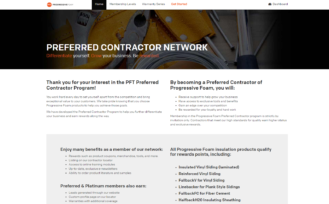 Our team created a partner portal for Progressive Foam Technologies' contractors and distributors to log in and register warranties and learn to market their products. We developed educational training sections where Progressive Foam Technologies can go in and create training courses for contractors and distributors to learn valuable marketing tips by engaging with readings, videos, and quizzes. Contractors and distributors answer a set of questions to move onto the next unit to finish the full course. Inside the partner portal, we also created a Rewards Center. Contractors and distributors gain rewards for registering warranties for Progressive Foam Technologies' products and they can cash in their rewards for company merchandise. Along with the Reward Center, there is also a Reporting Center where contractors and distributors can view their own personal growth through comprehensive reports. 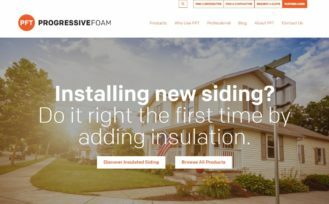 We also implemented a popular forum for marketing products that users can ask and answer questions about Progressive Foam Technologies' products and share the best marketing techniques with one another. This reporting feature is also critical to Progressive Foam Technologies because they can easily access the registered warranties and view the progress of their contractors and distributors. All of these features can be accessed by logging into the partner portal through their website or the app COSO Media developed for mobile use.